In the previous article in this series on parenting anger, I mentioned this next step is the glue which helps hold the integrity and authority changes in your parenting in place. Here is why this step plays such an essential role in repairing any disconnect with your child when your parenting anger has caused division in the past. Looking at our children through a nonjudgmental lens can be very difficult. We tend to have strong feelings for how much we desire to see our children succeed. These strong feelings can easily be read by a child through nonverbal communication. When our body language shows we are nervous, stressed, or even bothered when a child fails, our reaction passes along judgmental overtones. These reactions, if repeatedly observed by a child, will convey a parent’s inability to accept failure even without any verbal communication. Most of the time when we struggle with accepting our child’s weaknesses, it stems from our own inability to accept our failures. If you struggle in this area, and in accepting yourself for being less than perfect, then the first thing you need to realize is that failure is an essential part of life which helps us, and our children grow and learn. A while back I wrote an article called Failing to Learn where I stressed the importance of learning how to accept failure as part of the learning process so mistakes can be launching points for more learning instead of roadblocks of further exploration and understanding. With each mistake, we are given the opportunity to see how and why we failed. From there, we must choose to take what we learned in failing, and joyfully move forward in the hope that our next attempt will be better than our last based on what we learned in the last go-around. When we can change our perspective about failure, the mechanics of accepting our children also becomes much easier. We are more prone to say “oops” when mistakes happen. And, our child’s limitations are given flight to become vehicles for greater discoveries. When we start to make this shift towards accepting a child’s limitations and working on our responses to their failures, we also need to change our approach in how we redirect our child’s reaction to their failures. This is where the big change in your parenting needs to happen to glue all these elements together…and to prepare for the final steps in cultivating your child’s heart. When a child sees your reactions to their failures as an attack, you, in turn, will become the object for any out-lash in dealing with internal feelings of inadequacy. You essentially become your child’s punching bag because your reaction comes with a dual meaning. First, it conveys to your child you are safe because your love for them is what caused your reaction to their failure, but secondly, you are also an enemy because your reaction has placed you in their battle zone. Thus, instead of your child taking on the real issues he/she is facing, exposed through failure, your child makes the issue about your relationship. If you were to view this scenario as a boxing ring, your child would be in the battle of life with you in the same ring. There are many things your child battles each day, but your job as a parent was never to be his opponent. Instead, you have been called to be a coach who can provide fighting strategies for all the important things he fights through in life. By accepting your child’s fight as part of the learning process, and your role as the ever-vigilant coach through this training period in your child’s life, your goal will be to remove yourself from the ring by accepting your child and battles they are up against. Win or lose, you must show you are willing to stick it out while learning alongside as to what works and what doesn’t with failure, and success, leading to the winning strategies. Each time your child tries to get you into the ring, you must make a dedicated effort to keep your feet out of the battle zone. And when needed, calling a “time-out” a break until your child is ready to receive training instead of taking you on in the ring. Over time this process will become easier, especially as your child starts to see the value of having you working with them to fight these struggles instead of being frustrated, embarrassed, or upset when they fail. 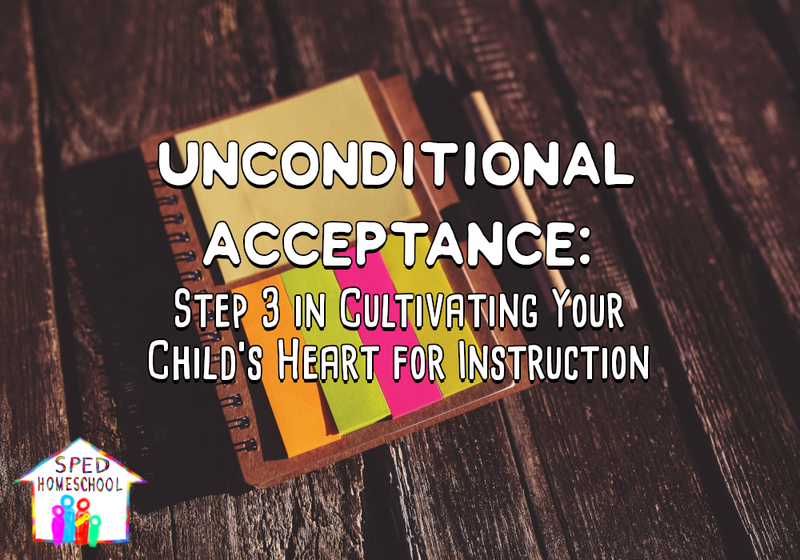 In my next article, we are going to continue with the next step in the process of cultivating your child’s heart, which is forgiveness. Until then, make sure to keep fighting the good fight alongside your child and make sure you are getting the encouragement you need to keep pressing on. One way you can get exclusive resources and a monthly dose of encouragement in your inbox is by subscribing to the SPED Homeschool newsletter. Also, make sure to check out our podcast channel or download one of the SPED Homeschool Conversations podcasts on iTunes or Google Play for lots of great content to encourage you in your family life, homeschooling, and special needs parenting. Your contributions keep our ministry running!